We’ve been having a lovely babymoon whilst PC has been home on holidays. I’ve been so spoilt, everyday he has washed the nappies, the continual pile of baby clothes and has taken care of all the umpteen details of running a household of twelve. Amongst it all we’ve found time to just lie and gaze at our girl and murmur to one another, “I can ‘t believe we have a girl! !”, we really, really can’t. Sadly PC returns to work on Monday and I’ll be returning to laundry detail. I managed my first shopping trip today in search of pretty, girly dresses, hitting Target and Best & Less. Sadly dresses are not abundant amongst the newborn options, mostly choices are pants & tops or romper suits. The majority of dresses were white, after three boys I’m rather keen to see pink & more pink. I’ve been most delighted to receive a few pretty outfits from friends and today my sister sent a package of the most pretty dresses, there are more options in the City. Yesterday I received an incredible gift from my friend Karen, a real gift of love and one that is greatly treasured already. 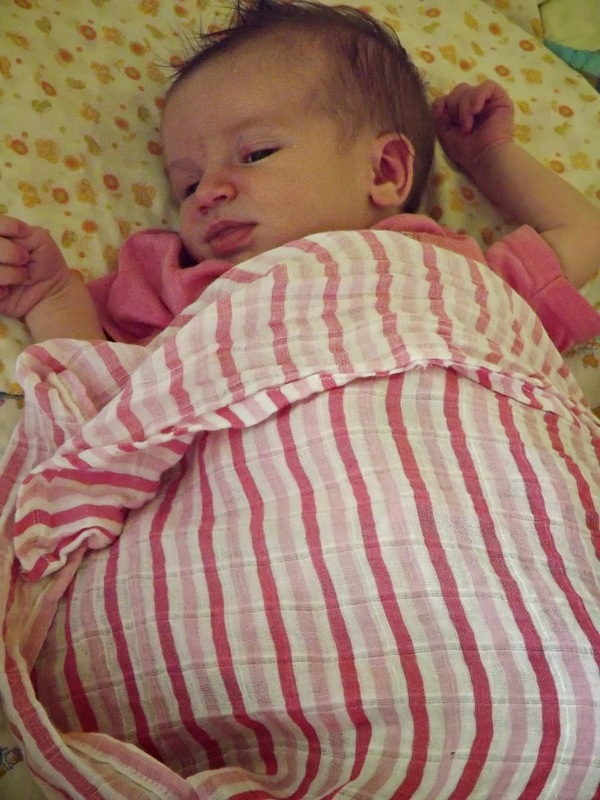 Karen made a beautiful cot size quilt, and all in the space of 5 days!!!! When Bass was born Karen made a pinwheel quilt, she hadn’t planned on making a new quilt but when I had a girl she couldn’t resist. Aren’t friends the best!! Be sure to click over and see how beautiful this quilt is. We experienced a heat wave today, so very, very hot. Temperatures reached 40C (104F) today though tomorrow will drop to 35C (95F). So hot I had to rescue the chocolate stash in the pantry as it was all turning to a puddle. Can’t say my house de-clutter is still going strong, I started out well, made solid progress for a few days and then petered out. Rather frustrating as I only have two rooms to go, still I’m certain I will get back onto it sometime soon. I resolved to take 10 photos daily this year and I’m off to a solid start. When I shared my goal with PC he remarked that would be 3000 photos for the year, sounds good to me:) What I’d really love is to be as good as a photographer as Sarah and Karen, a goal to aim for at least. As Pam requested sharing another photo of our Bella, after all she’s my main photographic subject at present. Truth is though I’m struggling to capture just how gorgeous she is, any baby photo tips would be gratefully accepted. I was thinking of you during today's heat (not that it's cooled down much yet). SO pleased you received a wonderful parcel of clothes in the mail – what a blessing! Really enjoyed our time with you yesterday and keep on sharing your photos of Bella! Keep practicing and editing (maybe PicMonkey). PS I looked in Big W yesterday also – nothing special there at all…. Beautiful quilt and baby! I'll send you some cold if you send me some heat. I woke up to 1F this morning! It's suppose to be lows in the negative numbers next week. This is not normal temps for here, but not uncommon. Oh, yes pink dresses! And take lots of pictures to share because I only have boys!! Good luck on the pictures. I have a goal of actually just taking pictures of my oldest birthday later this month. I normally take one and that is the only picture I take this month. Must do better! Love the quilt!!!! What an awesome gift. I'm so glad you are tickled pink with your little girl. She is precious! Ask and ye shall receive. Yay on the beautiful baby picture. If you do take 3000 photos this year you WILL be a better photographer. Of course I find I have to take 20 to get one good one at least. Your quilt and your friend Karen are both amazing. And we are having a horrendous cold front here. Brrrr temps down in the 20s (F of course — so below 0C) which is rare in the American South. Right now I would just about take your heat wave. And I sent you an email. So glad you've been enjoying your baby-moon! It is sad when they have to go back to work isn't it. I've been wishing we had some type of family home business. That quilt is a beautiful gift! I just love quilts, I wish I had Karen's skill. Just lovely! Trying to find my second wind for de-cluttering too. We have too much stuff for our new place. We are going to have to cut back to the absolute minimum. But I get very sentimental about clothing and find it hard. With you too on the photo taking. I'd really like to get my blog posts more frequent also, to record this year. That quilt is divine – I love it! As for baby photography tips – I found that if I just lay down a solid colored blanket or sheet it makes it a lot easier to get the photo I want to look professional. Also try to take pictures in natural light – by a door or window. I'm definitely not a pro but those two tips help me a lot. Loved your visit, too long since the last one! Thanks for the photo encouragement, always striving. Encouraging you to take at least 2 photos a day, one of each boy. Tickled pink – you're too funny! That's what I figured, I know I've improved since I've picked up the camera more. Keep taking photos of your little man too! They're so lovely! Let me know how your decluttering is going, hearing about someone else's success is nearly as good as succeeding myself.